Brunel Engraving Company are proud to present this superb quality wall hanging perpetual plaque. 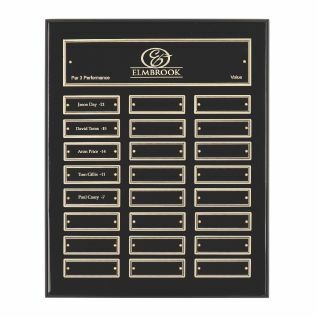 Measuring approx 12" x 15", this beautifully crafted plaque features 1 x header plate and 24 x brass engraving plates, enough to last the next 2 years. The "Title Engraving Plate" and "Perpetual Engraving Plates" are all finished with black lacquer with bright brass edges. When these brass plates are engraved through the lacquer the lettering shows up to maximum effect. Whether for business or sport, this plaques modern design and high quality materials makes it a popular choice.